Memo : Shopping Cart Payment. Deposit to SEVEN WONDERS LTD User richinvestmonitor. Memo: Withdraw to analysis from SEVEN WONDERS LTD. The amount of 0.1 USD has been deposited to your account. Accounts: U18888206->U5430333. Memo: API Payment. Withdraw to HotHyipsMonitor from SEVEN WONDERS LTD.. Date: 12:52 05.11.18. Batch: 234870797. 06.11.18 06:28 Transfer Sent Payment: 60.00 USD to account U18888206 from U1294xxx. Batch: 234954705. Memo: Shopping Cart Payment. Deposit to SEVEN WONDERS LTD User allhyips. 06.11.18 18:48;Account;Receive;Received Payment 0.4 USD from account U18888206 to account U1294000. Batch: 235044158. Memo: API Payment. Withdraw to allhyips from SEVEN WONDERS LTD. Memo : API Payment. Withdraw to richinvestmonitor from SEVEN WONDERS LTD.
08.11.18 12:30;Account;Receive;Received Payment 1.76 USD from account U18888206 to account U1294000. Batch: 235249409. Memo: API Payment. 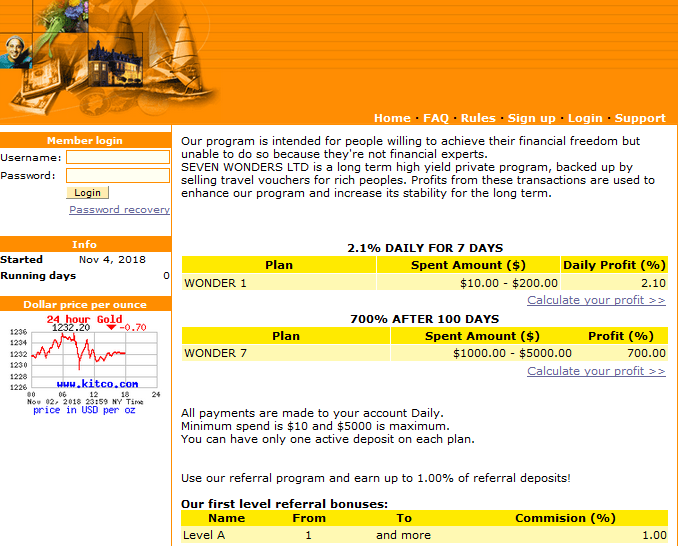 Withdraw to allhyips from SEVEN WONDERS LTD.